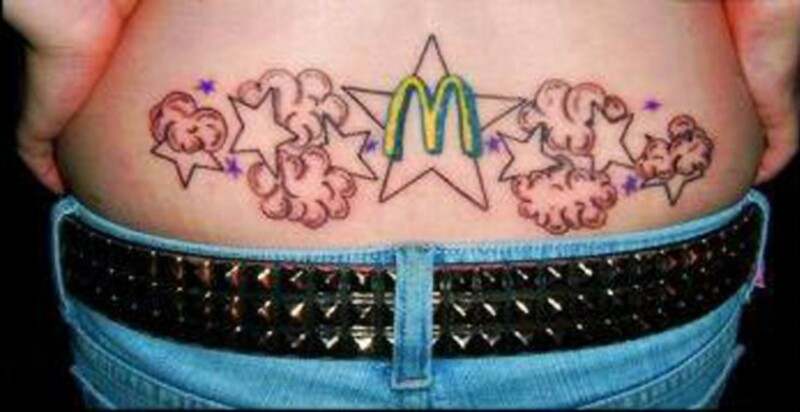 Well, that tattoo covers all the bases: McDonalds, Burger King, Wendy’s. Sure, we get it; you like fast food. But Dairy Queen? Have a little self-respect, sir. This is… certainly very detailed. What exactly is on top of those fries? Glue? For many, slinging pies at The Hut is just a summer job, but for one brave employee, it’s a lifestyle. The artist has rendered the Colonel a little bloated and red faced here, perhaps as a subtle warning to viewers about the dangers of doubling down. Or perhaps Colonel Sanders is simply notoriously difficult to copy, like a Vermeer or Michelangelo’s David. Is that the Hardee’s star? Hipster points for obscurity. We hope for this guy’s sake that he does indeed always love it, or at least that Mickey Dee’s doesn’t change their slogan anytime soon, leaving him forever branded with an outdated reference. The location of the McDonald’s logo coupled with the gaseous shape of the clouds are perhaps a little too reminiscent of an embarrassing consequence of one quarter-pounder too many. Pro Tip: If you find human teeth in your Big Mac, alert a manger. And finally, here’s one last rancid image of the Colonel to haunt your nightmares.